I'm Dennis, and I'm a recovering audio book junkie. Few years ago I used to go to the library every week and grab audio books by the armload. It got so bad, it didn't even matter if it was a book or an author I was familiar with, I'd just grab the next batch off the shelf, take them home, and listen to them in the car to and from work. I wasn't even listening to music anymore. Sometimes, I'd play them while I wrote in the morning. Usually all that I got written those mornings was . . . nothing. Then I changed jobs and now my commute is a good three minutes, and I've stopped stocking up on the audio books. Sometimes I miss them. My favorites were the full presentation ones, the audio dramas, with actors and sound effects and the whole works. There aren't near enough of those produced. There's a new company now, though, Strange Interludes, out of Fort Worth, Texas. Their first production, Paradox (written and directed by Stephen Couch) arrived in my mail a few days ago and I'm listening to it now for the fourth time since . . . well, since this morning. It's almost 9:30 PM. Paradox is a science fiction story about April (played by Angie Ingram) whose predicament is laid out in the story's opening. "Every morning, when the alarm clock shocks me awake, I see things differently. I see things from my memory, from my original home. That pile of clothes over a chair, for a moment it's a food synthesizer. The cardboard box, still half-filled with unsorted junk: a communication unit. But my eyes focus in the morning light, and I remember exactly where I am." "It's useful to keep up on current events in this time period. They didn't give me a full dossier when they sent me back here. But then, they didn't need to; I was supposed to be here for an hour, tops, just long enough to collect some cultural data. Not long enough to start a life." Stranded in the past, April, has been eking out a living for the last 5 years with a crappy fast food job and an equally crappy apartment. She doesn't have a car or a phone. But she's got a therapist. April's been hearing voices coming through the television, tormenting her, and she's on medication to quiet them. Her therapist, Teller (played by Angie Whitley) changes her prescription, but April, desperate to keep the voices quiet ("Kill. Only way. Change it all" the voice--played by Hank Ingram--instructs), April overdoses and winds up in the hospital. When she wakes, she hears the voice again, only this time it's a familiar voice, Carmen, a colleague from her future timeline. April's continued presence in the past has created a paradox and to make it right, and allow her team to retrieve her, April must kill President Ives. Ives (played by Brandon Bennett) is a Senator running for office, visiting April's town before the primaries. April decides that if she can reach the Senator and kill him she can repair the paradox and return to the life she misses. No, it's not a terribly original story, nor does author Couch (who plays a pimp, Simon) do anything particularly spectacular with it--even when Senator Ives is paralyzed by a stroke when he's not elected--NOW who is she supposed to kill? The voice said to kill PRESIDENT Ives--Couch's answer isn't a big surprise. Even April's diagnosis as a paranoid schizophrenic by her therapist who doesn't believe her stories about coming from the future are nothing new. So why am I still listening to it? Because damn it all if I don't dig me some audio dramas. Personally, I hope Strange Interludes catches on and explodes, cuz I want more of these. The Strange Interludes stories are professionally done, more so than some traditional new small presses, with background effects, developed stories (for all its cliches, Paradox is still well-written), and actors who, despite their apparent inexperience--Ingram's a good reader, an adequate character actress, but she's not ready for that nomination just yet--get their enthusiasm across very well. If I had to find a correlation, it's like listening to the cast of Clerks without the catchy dialogue. See what I mean? They'll get the point across, but no one's being moved emotionally by the performances. 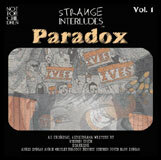 I think given a little room and time to grow, Strange Interludes can start turning out some really top quality product. I just hope whoever's in charge of selecting the projects knows when to reject the crap when it's submitted. I think this might be a market as yet untapped, at least to its full potential. With the right talent on board, this could be the beginning of something big. I certainly hope so. There are limits, however. If you don't have time to listen to the whole thing at once, it's hard to mark your place on a CD, even with track breaks (there are 13 on Paradox, running time 73:55). And I like to listen to music at work. I also like to read at work. But it's almost impossible to digest an audio drama at work. So the opportunities to dig into a Strange Interludes CD wouldn't be as plentiful as they would if these were published in print. But for those of who are self-confessed junkies, we'll find a way. We always do. Editor's Note: This book is available directly from the publisher at Strange Interludes.